Knowing Home attempts to capture the creative vision of Indigenous scientific knowledge and technology that is derived from an ecology of a home place. The traditional wisdom component of Indigenous Science—the values and ways of decision-making—assists humans in their relationship with each other, the land and water, and all of creation. Indigenous perspectives have the potential to give insight and guidance to the kind of environmental ethics and deep understanding that we must gain as we attempt to solve the increasingly complex problems of the 21st century. Braiding Indigenous Science and Western Science is a metaphor used to establish a particular relationship. Linked by braiding, there is a certain reciprocity. Each strand remains a separate entity, but all strands come together to form the whole. When we braid Indigenous Science with Western Science we acknowledge that both ways of knowing are legitimate forms of knowledge. The book provides a window into the vast storehouse of innovations and technologies of the Indigenous peoples who live in Northwestern North America. It is our hope that the Indigenous Science examples, research and curriculum models will inspire deep reflection regarding the under-representation of Aboriginal students in the sciences. It is intended that the rich examples and cases, combined with the resources listed in the appendices, will enable teachers and students to explore Indigenous Science examples in the classroom, and in addition, support the development of curriculum projects in home places. 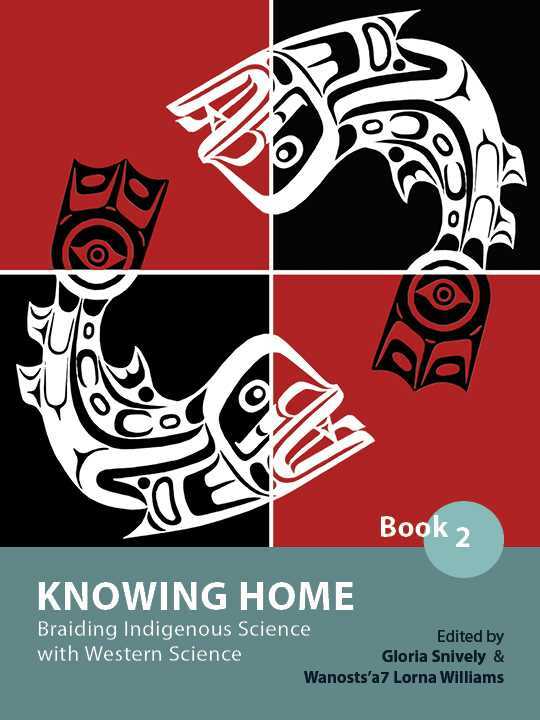 Knowing Home: Braiding Indigenous Science with Western Science, Book 2 by Gloria Snively and Wanosts'a7 Lorna Williams is licensed under a Creative Commons Attribution-NonCommercial-ShareAlike 4.0 International License, except where otherwise noted. Cover image: Sculpins2 by Trevor Isaac (2018). Used with permission. Lift Your Spirit by Una-Ann (2018). Salmon Twin Dancers by J.R. Rardon (2013). Sculpins by Trevor Isaac (2018). Untitled by Laura Corsiglia. Reprinted with permission from (2001) Our Thang: Several Poems, Several Drawings, p. 87. Victoria, BC: Ekstasis Editions. CC BY-NC. XAXE TŦE SȻÁ, ȽTE TEṈEW̱. XAXE TŦE SȻÁ, ȽTE SḰÁL – Our land is sacred. Our language is sacred by David Underwood (2018). Snively, G., & Williams, Wanosts’a7 L. (Eds.). (2018). Knowing Home: Braiding Indigenous Science with Western Science, Book 2. Victoria, BC: University of Victoria is used under a CC-BY-NC-SA 4.0 International License, except where otherwise noted. References to Internet websites (URLs) were accurate at the time of writing. Neither the author nor the University of Victoria is responsible for URLs that may have expired or changed since the manuscript was prepared. For questions about this book, please contact the ePublishing Services, University of Victoria Libraries at press@uvic.ca.